The ever popular Roberts Revival DAB radio gets a cute canine makeover courtesy of Clarke and Clarke's Rover design. This is the 1970s, right down to the brown paint job. we're talking about this Rover 3500S car, which is up for auction right now. A really distinctive car – and this Rover 2000TC has done little over 10,000 miles since it was produced back in 1973. Indeed, it has had just one owner for the last 33 years, that owner doing just 440 miles since 1994. You can safely say it's in great condition. It's also got some added authenticity, sold with the maker's literature pack, two sets of keys and sales brochure. There's even an 'as new' original spare wheel and tyre. 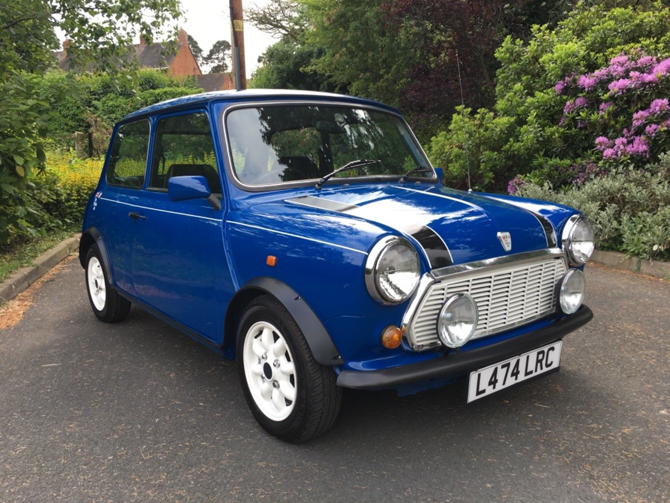 It's the classic car that needs no work at all to get on the road – and it can be yours for £4,995. Lots more photos on the listing page. I'll be honest, this is probably the most modern eBay find we've ever done. But it is a classic / original Mini and not just any older Mini – it's a limited edition Paul Smith-designed Mini. Yes, Mary Quant wasn't the only fashion designer to get her hands on the Mini, Paul Smith did so too in 1999, with 300 of his themed Minis offered for sale. How many are left? That's anyone's guess – but almost certainly less. For your money, you get a standard (for the time) 1275cc Mini, but packed with extras, including a 24ct gold badge on the bonnet, a British Isles badge on the grill, citrus green 'hidden parts', a denim jack bag, body coloured dashboard, black leather seats and plenty of Paul Smith branding. Condition seems fine, with the odd mark here and there, but at £1,500, it seems a reasonable price.